In August of 1965, my father (Dr. L.N. 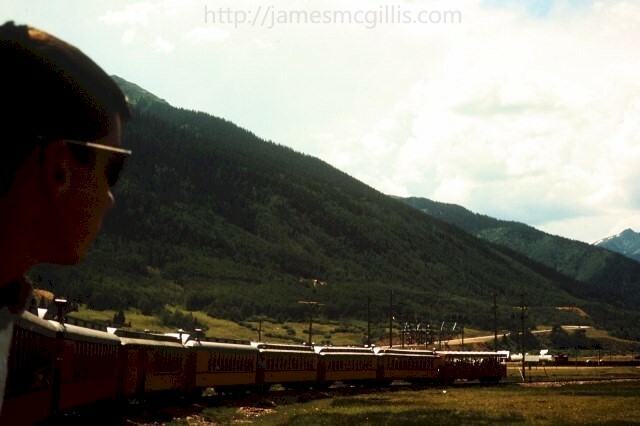 McGillis) and I visited Durango, Colorado. 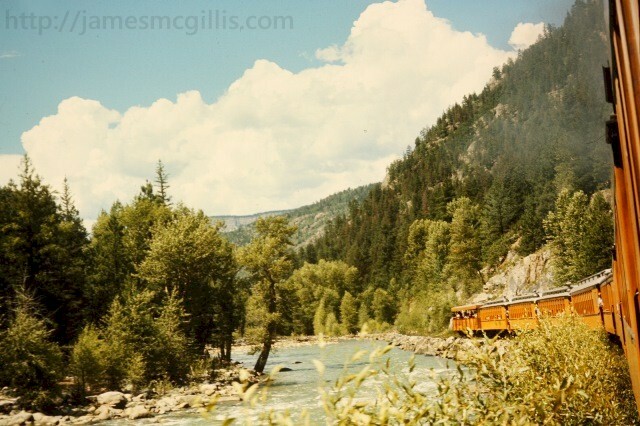 One of the highlights of our visit was a ride on the old Denver & Rio Grande Western Railroad (D&RGW) from Durango to Silverton, forty-five miles north. At the time of our visit, the Durango to Silverton line was already 83 years old. 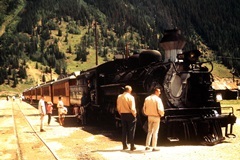 By the 1960s, steam locomotives had largely disappeared from the main railroad lines throughout the U.S.
Today, over forty-eight years later, a few heritage lines like the Durango & Silverton Narrow Gauge Railroad continue to roll. What makes the Durango & Silverton line interesting to me is how little it has changed since its inception the 1880s. Although heavier tracks now support the larger K-36 “480 Series” locomotives both those and the original K-28 “470 Series” locomotives began service in the early 1920s. Built to roll on tracks that measured a mere 3 ft. between their rail heads, the 470 Series engines were purpose-built for the narrow gauge. 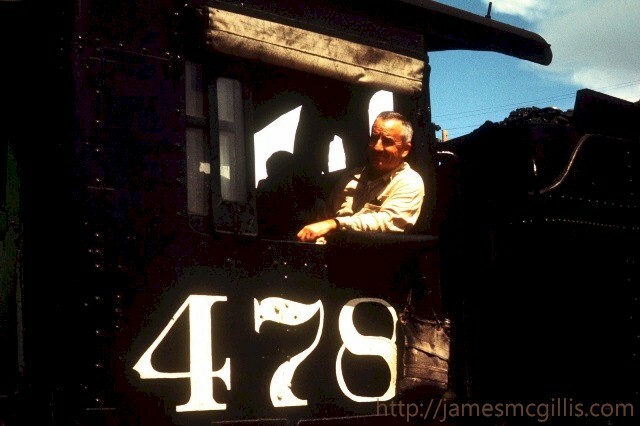 The larger, 480 Series engines started life at standard gauge, measuring 4 ft. 8 1⁄2 in. from wheel flange to wheel flange. In 1965, old rails, which weighed about 45 lb. per yard, lay stacked alongside the tracks in many places. In preparation for the heavier 480 Series engines entering into service on the line, crews installed new tracks weighing up to 90 lb. per yard. In preparation for our 1965 excursion, my father and I had visited the Durango Depot early in the morning. With our film cameras in hand, we had snapped pictures of the first section, powered by Engine No. 476 as it departed Durango for Silverton. Soon, it was time for us to board the second section, led by Engine No. 478. 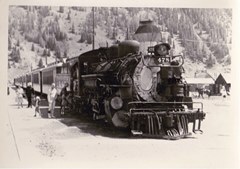 In those days, the tender cars of both engines featured a stylized “Rio Grande” logo. 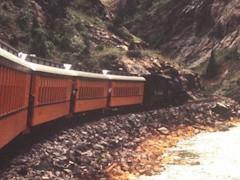 Reflecting a change of ownership in the early 1980s, the same trains today feature the “Durango & Silverton” name. Although Engine No. 478 sported a traditional black and silver paint scheme, the ten passenger cars in our train were painted bright orange, with black trim and silver roofs. At that time, each passenger car still featured a rooftop chimney. In earlier days, the chimneys vented coal-fired stoves, which heated the cars during the colder months. Although most of the passenger cars on the line today retain their traditional livery, the stovepipes are now gone. After we departed the Durango Depot, the steam whistle sounded each time the train approached another grade crossing. With no less than eight grade crossings in town, the engineer and fireman were busy watching for cross traffic and letting the steam whistle wail. 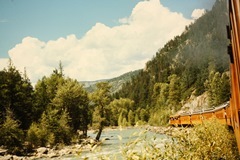 After making its way across the Animas River Bridge north of town, the train began its slow ascent through the picturesque Upper Animas Valley. Unlike current diesel locomotives, steam engines use a constant flow of water to recharge their boilers. At the old Hermosa Depot, we stopped to fill the water tank on the tender car. 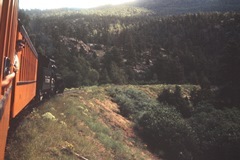 Once we were moving again, the 2-8-2 Mikado began a more serious climb into the former San Juan mining district. In the 1880s, passenger and freight service to the numerous mines was the original impetus for laying tracks up the series of steep grades. Built in less than two years, construction required the blasting of solid rock from the canyon walls. Construction crews shuttled the resulting rubble to create a riverside bench for tracks laid along the lower sections of the line. Despite periodic flooding along the Animas River, the rubble rock staved off the floods and supported the tracks. 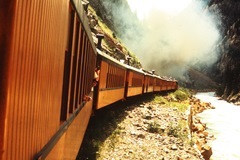 Over one hundred thirty years after railroad tracks first linked Durango and Silverton, the route remains essentially unchanged. 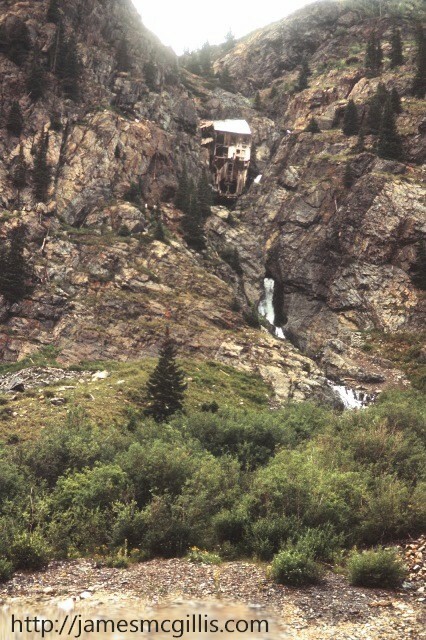 In the early twentieth century, when regional gold and silver mining collapsed, various abandoned mines remained, some hanging precariously on the canyon walls. Built with wood from nearby forests, many were unpainted and thus exposed to the elements. 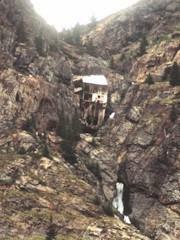 In 1965, we were amazed to see how many of the old mines remained in the Animas River Canyon. In the 1960s, they were a picturesque reminder of an earlier day. In the 1960s, professional photographers hiked up into the canyon and meticulously photographed every remnant of that short lived but industrious time in Southeastern Colorado. Many of the photographs found their way into wall calendars of the era. While researching this article, I was sorry to find that none of those earlier mine photos has survived on the internet. In order to personalize our photographs of the journey, I hiked from one end of the train to the other. Whenever we would go around a dramatic curve, I would lean out from a platform or a window. At that time, no one told us to keep our heads, hands and arms inside the train. By the time we finished our trip, we had many images of me looking back toward the camera, or rounding a curve and one as we pulled into the Silverton Depot. 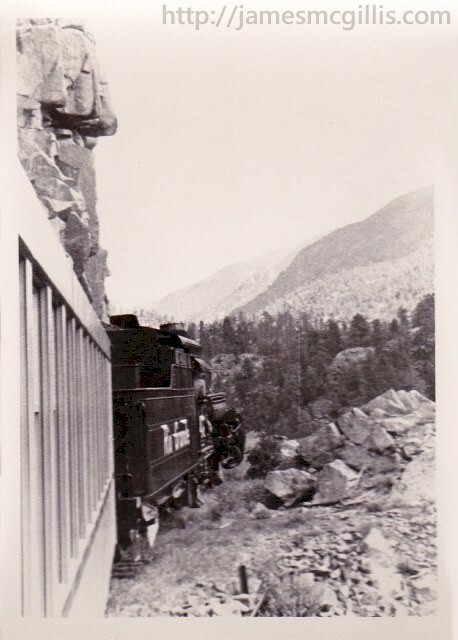 As first time passengers on the Durango & Silverton line, we did not realize how long it would take to complete the trip. Including time for several water stops along the way, the train took three and one half hours to travel the forty-five mile route. That meant we averaged just less than thirteen miles per hour. As exciting and interesting as the experience was, we were happy to arrive in Silverton in time for a late lunch. Until its peak in the early 1900s, Silverton had serviced the needs of miners from throughout the high country. By the 1960s, Silverton was living off its legacy as a former mining and commercial center. Many buildings were empty and falling into disrepair. Land and property in the remote town was selling at an all-time low. Only a few restaurants and old time hotels supported the town. When I visited again in 2007, I met a white haired old man who had bought property in Silverton in the 1970’s. As modest as the man was, the list of properties he then owned in town was worth in the millions of dollars. In the 1960s, passengers could wait in line for a chance to visit with the engineer in the cab of the locomotive. When it was his turn, my father climbed into the cab of Engine No. 478 and took a seat in the fireman’s location. In the picture that I took of him that day, looking forward and down the track, he looked every bit like a professional railroad engineer. Although the steam engine was huge, the area between the cab and the tender was not spacious. There was barely room for the fireman to take a scoop of coal, step on the lever that opened the firebox door and toss the fuel in. Like a pizza oven, the idea was to minimize the frequency and duration of door openings, thus keeping the firebox hot at all times. While waiting in Silverton for our return trip to Durango, we had time to inspect all of the running gear on the huge engine. Dripping hot water and emitting small jets of steam were the twin air-brake compressors that hung low and wide near the front of the engine. Using a system originally devised by George Westinghouse in 1868, steam from the boiler would occasionally cycle into each compressor. There, a steam driven piston would pump air into a reservoir. Within the Westinghouse air-brake system, low pressure in the brake lines activated the brakes. With the train parked on level ground at Silverton, the occasional cycling of the air brake compressor was the only sound that the engine made. When it was time to depart, the Head Brakeman used a valve within the cab to increase pressure in the lines, thus releasing the air-brakes along the full length of the train. After a couple of hours in Silverton, a blast from the steam whistle indicated that it was almost time to depart for Durango. In those days, the train parked head-in at the station throughout the visit. Upon departure, workers threw manual switches along the tracks, thus allowing the engineer to back the train on to a wye track. 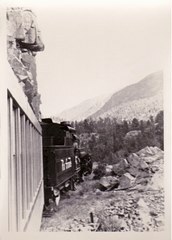 Once safely on the wye, other switches were thrown, thus allowing the train to proceed down canyon toward Durango. Over time, these procedures have changed. Now, while the passengers are enjoying lunch in Silverton, the trains back on to the wye, pull forward briefly and then backs into the Silverton station. When it is time to go, the engine is facing in the correct direction for travel. When the old Denver & Rio Grande Western Railroad began service between Durango and Silverton, the train was far faster than the wagon road previously used. Today, that is no longer the case. Although the route of U.S. Highway 550 (the Million Dollar Highway) between the two towns is three miles longer than the rail line, it takes only an hour to make the trip by automobile. With a three and one half hour train trip back to Durango, the final hour of travel can become tedious. Passengers now have the option of taking a motor coach in one direction and the train the other direction. Also today, passengers can opt for more luxurious seating, beverage service and snacks in one of several parlor cars. 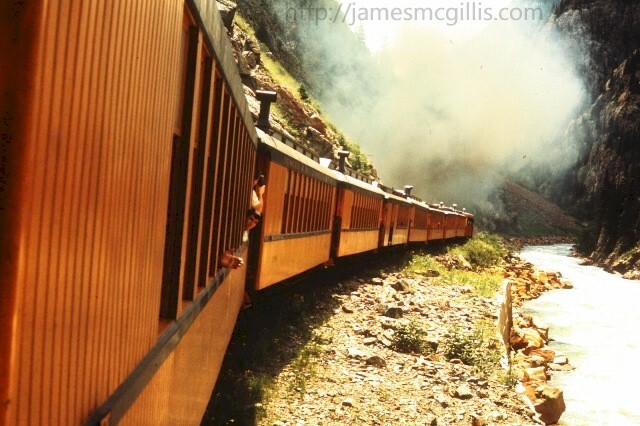 Any way you go, the Durango & Silverton Narrow Gauge Railroad is piece of American history that travels through some spectacular scenery. Several times in its history, the railroad almost went broke. With its current popularity, the line now boasts up to three trains per day during the peak summer season. 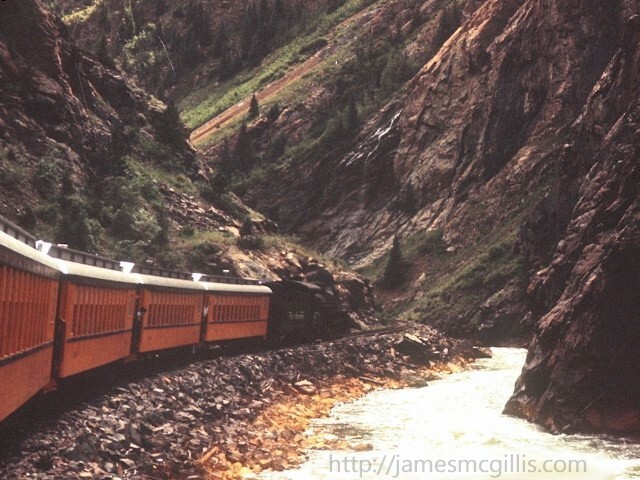 With that revenue stream, I expect to see the Durango & Silverton Narrow Gauge Railroad prosper for many years to come. This Part Two of a two-part article. To read Part One, Click HERE.